It's as rare as the Rolls-Royce Sweptail, but considerably cheaper. 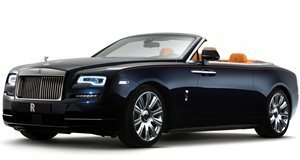 Rolls-Royce has built several one-off specials for privileged customers throughout its history, but few are as unique as this. Back in 2008, the luxury automaker joined forces with Italian design house Pininfarina, and the result was this: the Rolls-Royce Hyperion which debuted at the 2008 Pebble Beach Concours d’Elegance. Originally commissioned for car collector Roland Hall, the Hyperion is based on the Phantom Drophead Coupe with a retro design inspired by luxury convertibles from the 1930s. It’s the only example in the world and was the last coachbuilding project supervised by Andrea Pininfarina before he died, so of course it’s commanding a hefty asking price. At the front, the familiar Rolls-Royce grille has received some subtle aerodynamic tweaks. Not so subtle are the recessed Bi xenon LED headlights. The rear seats were removed to transform the convertible into a luxurious two-seater, and the bodywork is made entirely from carbon fiber apart from the solid wood doors. The roof is also bespoke, featuring a fabric soft top that folds behind the rear seats under a wood-lined cover. Inside, the cabin was left largely unchanged featuring copious amounts of wood. There’s even a watch created specifically for the Hyperion by Swiss marque Girard-Perregaux mounted on the dashboard. Under the hood lies a 6.7-liter V12 engine producing 453 hp and 531 lb-ft of torque. And in case you were wondering about the name, the Hyperion is named after one of the Titans of Greek mythology. This one-of-a-kind Rolls Royce Hyperion is currently listed for sale at Dubai-based dealer Alain Class Motors for the cool sum of 2,000,000 Euros (around $2.39 million). That may sound expensive, but it's still considerably cheaper than the extortionate Sweptail despite being just as rare.